Latest Telugu Movies, Regional, Indian Movies, Kollywood, Sandalwood, Mollywood, Bollywood and Hollywood Movie Breaking News and Gossips Updates Online News Portal AmaravathiNewsTimes.com. Pawan Kalyan's Fan and Jana Sena Leader Seethala Mohan Chandu thought of establishing a statue of the Iconic Personality in Tadepalligudem. Penugonda Aruna Prasad and Penugonda Karunakar, Sculptures of AK Arts in Natta Rameswaram, were hired to make the statue. In 2014 itself, Pawan Youth proudly declared that the statue of Jana Sena Chief would be unveiled at a main centre in Tadepalligudem. 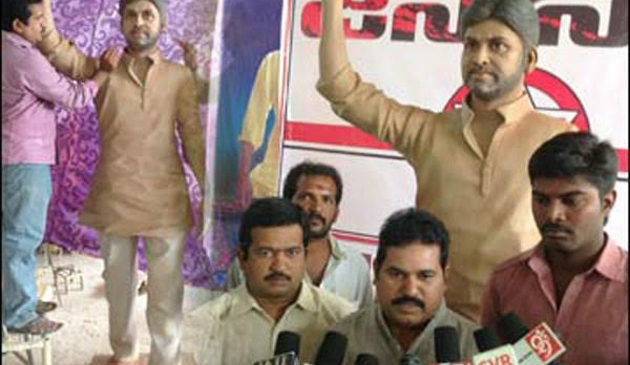 But, Pawan Kalyan made it clear to the fans about his reservations on the statue and disapproved the proposal. As a result, Fans dropped the idea of unveiling the statue and covered it completely. Recently, The cover of the Pawan Kalyan statue was found partially removed and it's photos went viral on the social media. How does PK and Fans respond to this development? First Look: Shiva Rajkumar in Satakarni! Shiva Rajkumar reprised a crucial role in 'Gauthamiputra Satakarni'. First Look Poster of the Kannada Star was unveiled on the eve of his Mother Parvathy's birthday. Families of Rajkumar and NTR have always maintained a healthy equation. Now, Their Successors were taking the bonding to the next level by sharing screen space in a prestigious project. Shiva Rajkumar gave his consent to Krish when he was approached for a Special Appearance. Several speculations are in circulation but none from unit disclosed how Shiva Rajkumar would be presented in the historical subject. 'Gauthamiputra Satakarni' is expected to hit the screens on January 12th, 2017. Around Rs 70 crore were riding on Balayya's 100th flick. Can Nata Simha roar once again? Superstar Rajinikanth injured in ROBO 2.0 Shooting..fans upset! Tamanna bags huge money for that Night Party Event..!